Although it wasn’t always this way, these days I like to think I eat relatively well. The more I’ve read recently though, the more I realise that while my diet doesn’t necessary involve a lot of what you might consider ‘unhealthy’ foods, I’m probably not really getting the nutrients I should be. I also have a bit of a (read: major) sugar addiction. So for these reasons I’ve decided to give my diet a bit of a shake up – nothing crazy mind you, because I see no point in setting myself up for failure. 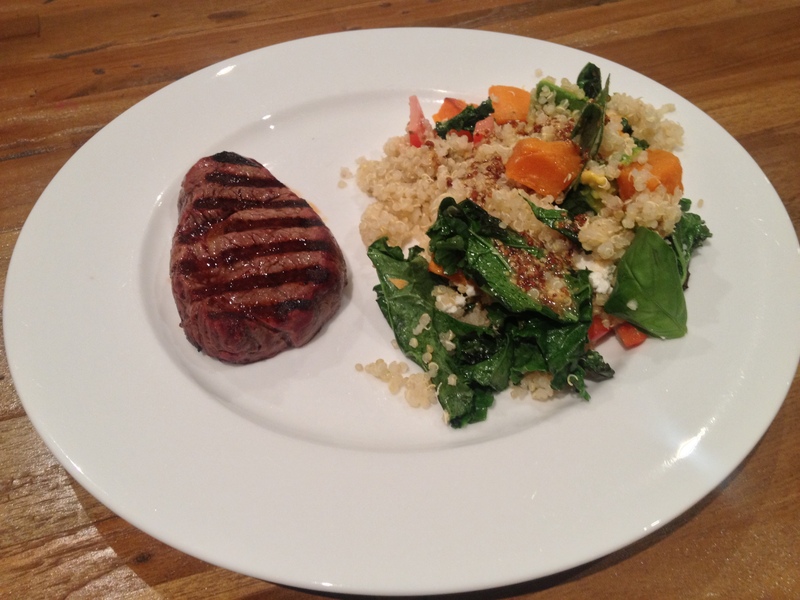 The aim is simple – less processed foods, less added sugars and more nutrient rich vegies, seeds, fruits etc. 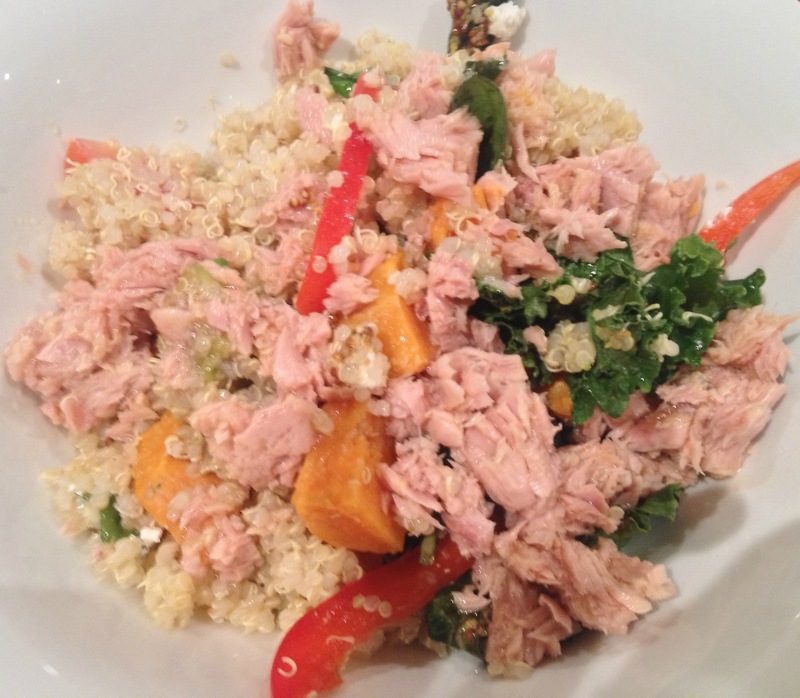 Combine cooked quinoa, sweet potato, kale (all still warm) with capsicum, tomato and avocado. Sprinkle fetta on top. DONE. All up I’d say it took me 30 – 40 minutes, but that’s really just due to baking time for the sweet potato. Makes enough for around four decent sized servings. I had mine with a small, beautifully cooked steak (thanks James). And the best news of all? Plenty of leftovers! Last night when I got home from training, there it was waiting for me. I just threw in a tin of tuna and enjoyed it again – with a twist! Final note – I hope my recipe is easy enough to follow – I’ve never really written one out before, so any questions, let me know! The photos look delicious! I am so inspired now. Lucy loves sweet potato too, so I shall buy extra for her. Thanks! I hope you love it! Lunch today will be the fourth meal I get from this – I know some people might find that a little boring but it doesn’t bother me at all! Today I’ve added some tahini so we’ll see how that goes. 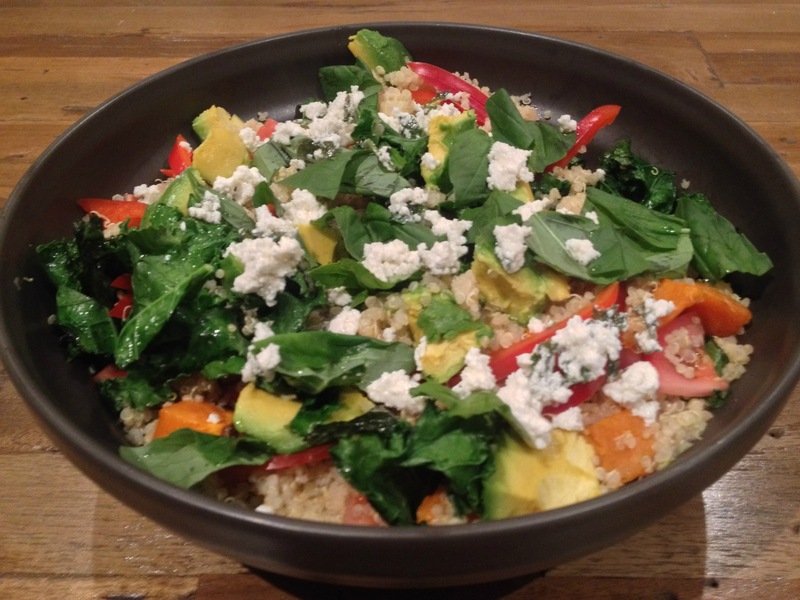 I’ve become obsessed with quinoa salads…. yummo. Have you tried the mushroom dukkah one from Grill’d, ohhhhh its good. No! I haven’t been to Grill’d in a long time – is it worth a visit?